NORRISTOWN, Pa. — Bill Cosby has been accused of sexual assault by more than 50 women, but the first and so far only criminal trial kicked off today outside of Philadelphia. Twelve years after Andrea Constand first went to police and said she had been sexually assaulted by Bill Cosby—and 11 years after she and Cosby settled in a civil trial—her story was heard in a Montgomery County courtroom. Here Cosby is charged with three counts of aggravated indecent assault for the night in January 2004 when, Constand said, Cosby drugged her and then sexually assaulted her. Cosby, who his attorneys claim is legally blind due to glaucoma, appeared in court without his wife Camille, but did arrive with actress Keshia Knight Pulliam, who played his daughter Rudy Huxtable on The Cosby Show. In opening statements, the prosecutor gave a similar account to the one Constand first gave in her civil trial—that Constand, then an employee of the women’s basketball team at Temple University, Cosby’s alma mater, went over to his house for mentoring and advice, where he drugged her and assaulted her incapacitated body. 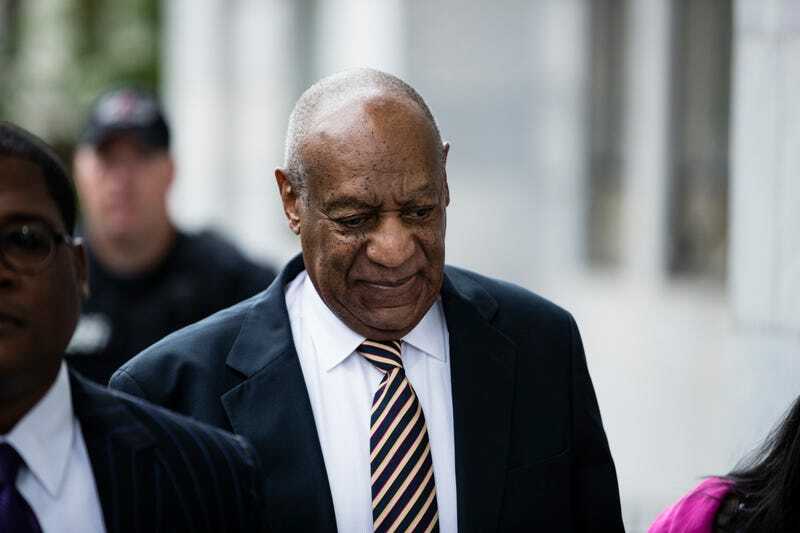 Cosby’s defense also echoed his claims from the civil trial, his deposition in which was released in 2015—that he is a good man whose life could be destroyed by a woman’s unprovable accusation. Montgomery County Assistant District Attorney Kristen Feden started by going over the now well-known details of what Constand said happened in 2004. She went over to Cosby’s home in Elkins Park, Penn., that night to seek his counsel about she she should do with her life, Feden recounted. Should she focus on basketball, or should she pursue her other passion, massage therapy? Constand trusted Cosby, Feden said, and he took advantage of that. Feden said Cosby brought Constand pills and told her to take them because they were an herbal supplement. Soon her body relaxed to the point she had no control over it, she alleged, and Cosby took her to the couch where he assaulted her as she slipped in and out of consciousness. This case involves “trust, betrayal, and inability to consent,” Feden told jurors over and over. ADA Kristen Feden gestures toward Cosby. Courtroom sketch by Jane Rosenberg. Feden laid out the prosecution’s case to come. Jurors will will hear from Constand and her family about how she was affected. They also will hear from another woman—who worked at the William Morris Agency, Cosby’s longtime Hollywood representation— about how Cosby similarly drugged and assaulted her in 1996. Yes, Constand continued to have contact with Cosby afterward, Feden said, because he was Bill Cosby, a titan not just in American entertainment but also a trustee of the university that employed Constand. Defense attorney Brian McMonagle speaks to the jury while Cosby looks on. Courtroom sketch by Jane Rosenberg. McMonagle then gave his version of who Constand was. There had been a romantic relationship between his client and Constand, he said. She changed her hair for Cosby, McMonagle said. She brought him gifts. And after the night of the alleged assault her relationship with Cosby was exactly the same as it was before. He there were 72 phone calls between Constand and Cosby afterward, and those included her calling him. He promised jurors he would point out ways Constand had given law enforcement different accounts of what happened that night, and all the reasons why an earlier investigation by a previous district attorney had ended without charges. McMonagle emphasized to jurors the burden of “beyond a reasonable doubt” and asked them to remember how high that is, especially compared to civil court. He told them to deliberate “like the rest of a man’s life depends on it.” He asked them to use their common sense and think about their own male family members. He did not ask jurors to think about the women in their lives.